This was intended as the sequel to Tidemarsh. Why I stopped coding it in 1992 I have no idea??? Well, here is the disk to run the game from emu or transfer to a real C64. The game is hard and this version has really hard levels - so be warned. The reason for this is that the levels were just done to test the alien movements and power ups, the game never got far enough to finish the levels. 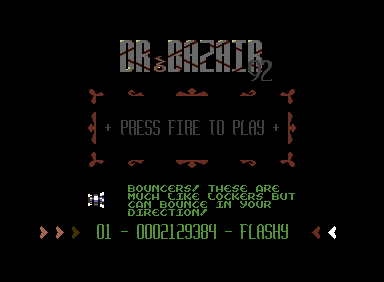 If someone would like to (or knows someone) finish it, all that it needs is the levels (I have a full ASM level editor for the C64 that can be uploaded for use in Vice) and also sound effects and highscore input. That I believe is all!!! This is a modified and possibly newer version of the game. Wiggy was working on new graphics as some have changed for the better and also some have not been completed! Also, the levels are slighly easier and there are more of them. 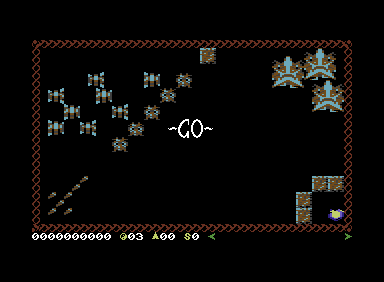 On level 1 you are safe from the bugs for a while and also the starmen only track you when you are firing. So, you can time your move from the beginning. mm, finally... i will try it right away..
mm as I see it TIME is the problem... why are there so few hours in a day?